Hey y’all, give me a little hug around the neck. Ya hear? I told you, I’m not that good at pacing myself; a pretty standard trait for those of us suffering with some bits and pieces of attention deficit issues. That’s a paradox, right? People who struggle to apply their attention, actually OVER apply their attention when they’re engaged with something that is of interest to them. Like “Friday Night Lights”. Scott said he feels like I’m cheating on him with this show. I’m always sneaking away to catch a few more minutes with my Friday Night Lights friends. I half listen to Scott’s stories, because in my head I’m busy trying to solve all my friends’ problems from Dillon, Texas. Not to worry. I’m almost done with all these people. I haven’t been eating and sleeping as much lately; I’ve watched almost 5 seasons in one month. It’s called commitment. You might want to try it. Maybe you could finally make something of yourself. Other things that have been happening while I’ve been living in Texas are college visits. Here we are. It’s time. Eddie has always seen himself as someone who’s going to college. When Eddie was in Kindergarten, he would come home from school and immediately put Scott’s videos of the Iowa Hawkeye wrestling tournaments in to the VCR. I remember thinking that was a little unique for a 5-year-old. Shouldn’t he be watching “Caillou”? Eddie couldn’t abide that little Caillou. Not even for a second. Poor Eddie. He’s so much like me, I hate to tell him how much. He loves what he likes. Eddie had an insatiable appetite for college wrestling. He still does. So, college is certainly on the horizon for Eddie. Good for him. Can I be serious for a few lines? I want to say out loud how much I appreciate the opportunity to consider possibilities. I didn’t always believe we’d be here. Eddie has a future. Eddie has a future. Eddie has a future. I’m just going to keep saying it until I believe it. 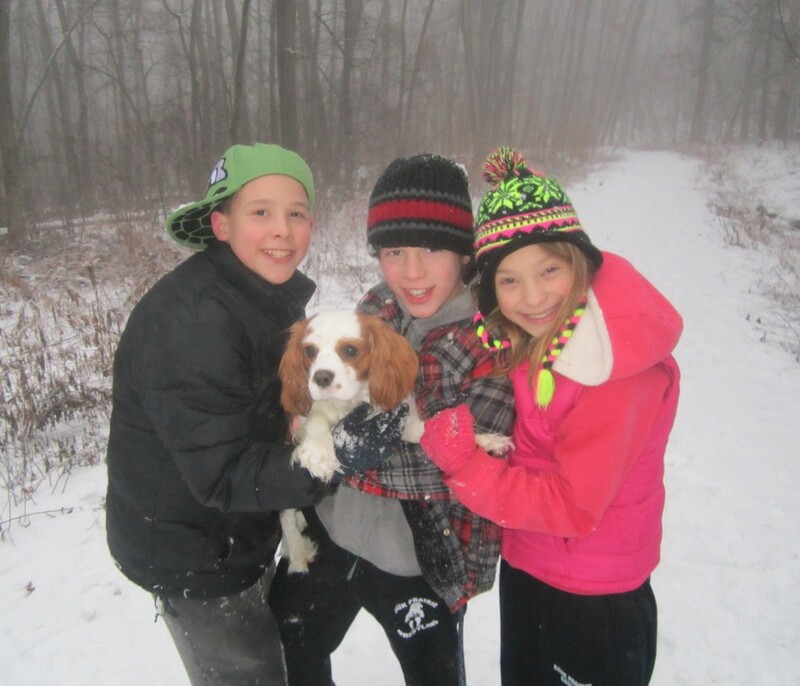 When Eddie was in grade school, we knew this wonderful family. This family had a couple of boys who wrestled for the Iowa Hawkeyes. One of these boys put together a care package for sick little Eddie from the Hawkeye wrestling team. The package included Hawkeye t-shirts worn by some of the wrestlers, including one t-shirt signed by everyone on the team. There were also some nice notes in the package, including a short note from Coach Dan Gable. If you say you’re a wrestling fan, and you don’t know Dan Gable, you’re busted. Gable is a wrestling legend; besides those Olympic gold medals he owns, he was also the coach of the Iowa Hawkeyes for many years. This note from Dan Gable gave Eddie a few words of encouragement. Gable told Eddie that it was good Eddie was getting all this sickness out of the way when he was young, so when Eddie was older he could do all the wrestling he wanted. This. For sure. This was the best gift Eddie has ever received. Hands down. No contest. We framed all of it, and it might be the only Earthly possession Eddie cares about. I remember reading Gable’s words, and feeling kind of hopeful. I mean, Gable didn’t know Eddie, or even what was wrong with Eddie. 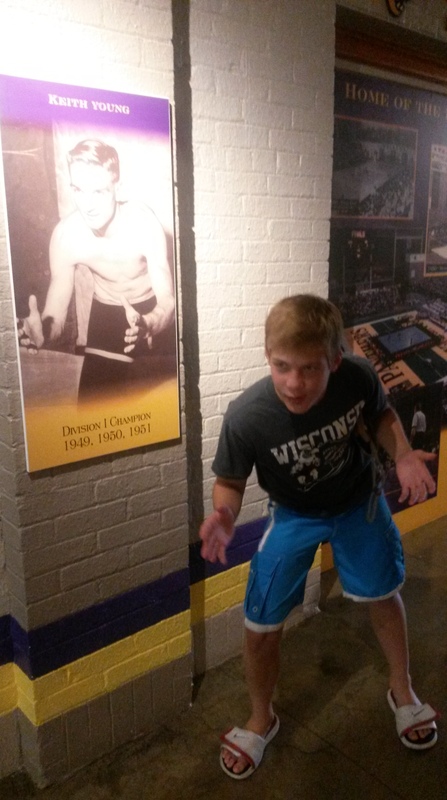 But, he was Dan Gable. Maybe he knew stuff about the future. I loved him for pretending he did. So, the future is now. Eddie’s looking forward to a college, and, hopefully, more wrestling. Gable called it. The first college Eddie wanted to visit was my Alma Mater. I wish this visit had something to do with me; it’s purely coincidence. Or, I should say, it’s purely about wrestling. When we were on vacation with Scott’s family last week, we took the opportunity to visit campus. I have not been to my Alma Mater since I graduated. It’s funny how quickly you remember things. I gave my family a tour; I wasn’t half bad. The kids wanted to know where I stayed on campus. I told them that their Dad and I were married then. I lived off campus with their dad while I finished college. The kids responded to this information with instantaneous disgust. Especially Olivia. Olivia is appalled that I did not have the independence nor the dignity to earn a college degree before I chained myself down to a man for the rest of my life. I told Olivia that while I respect her point of view, I do admit I really liked her Dad a great deal; I think there’s a decent chance things are gonna work out, despite our foolishness. 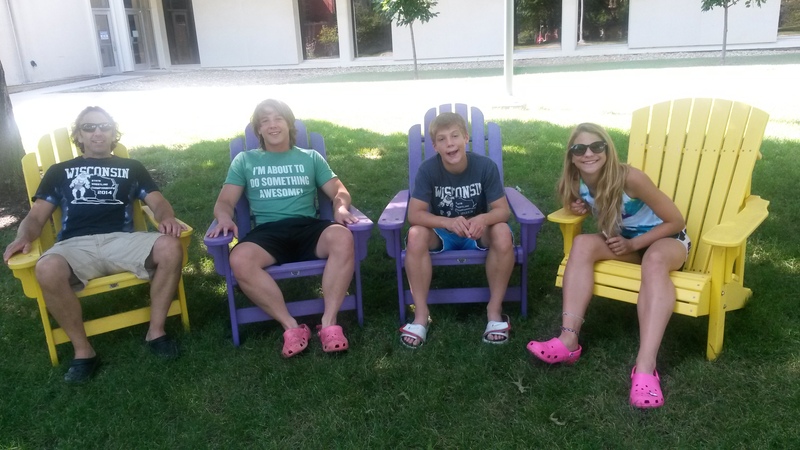 Just hangin’ around campus in our Crocs. Zeke wishes he was as cool as that guy. 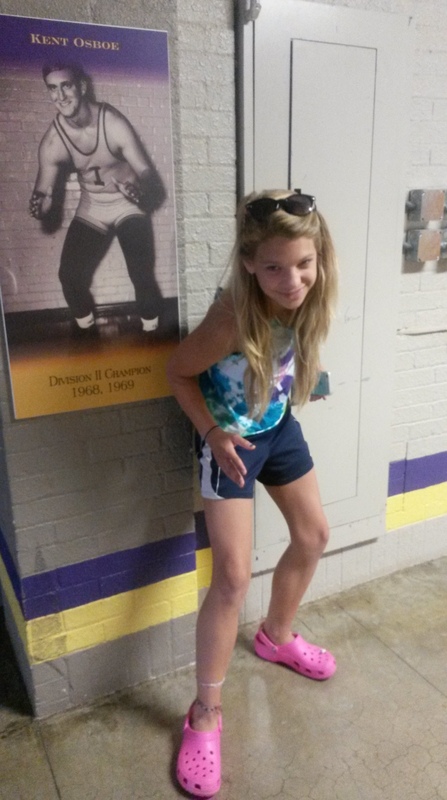 Her wrestling stance needs some work. I’ve only got a few minutes to hang out. I’m sorry. I am a super important, busy person. You probably wouldn’t understand. I’m sorta in the middle of binge watching “Friday Night Lights”. I know. I know. It isn’t entirely appropriate. I’ve got no defense, really. I just like these people I’m watching, and they’ve become my friends. I’m a pretty loyal friend, and I don’t think it’s right to ignore people, just because you don’t always agree with them. So, really, my sticking with these guys is more like a testimony on my part. It’s ministry. This show is about a football coach and his family. The show highlights the crazy that is football in the South. Stereotypes abound. Yet, somehow the way these folks talk and act in this show is believable. In the South, football is king. If this show is to be believed, in the South, the high school football coach is held in high regard, or treated like devil spawn. Depending on whether or not the football team is having a winning season. I’m married to a wrestling coach. I can NOT relate. We offer trophies to the wrestling fans in our town. Those four guys deserve to be rewarded for their loyalty. That’s a cheap lie I made up in an effort to get a laugh. I want to apologize for the that. The truth is, we live in the most awesome small town. Folks in my town show up for everything kids do. If you’ve got a teenage accordion choir ready to play a few numbers, you’ve got yourself a full house in my town. I’m such a fan of the fans in my town. I didn’t mean to waste your time with the big “Friday Night Lights” recap. I did just want to say that I like this show. I like watching the coach try to manage his intense desire to win with his solid moral compass. This internal conflict is poetic to me. I kinda feel that part of the show. I might know some guys like this. The other thing I wanted to do was drum up some sympathy. I have Jury duty in August. I know that it is my civic duty. I’m sorry for complaining. You’re right. I should consider myself fortunate to serve. I’m very busy with my career, and frankly, I cannot spare the time. Plus, what with me being only half way through “Friday Night Lights”, it isn’t like that stuff is going to watch itself. Right? I’ve got an idea to make things more simple. How about if everybody just doesn’t break the law? For goodness sake. How do people fit law breaking into their day, anyway? They might want to consider Netflix as a suitable replacement for thievery and murder. I might suggest this to the criminal’s who’s fate is in my hands. Yep. I just decided. I’m going to ask the Judge if I can share a few words. I should be able to get the criminal system turned around. I can’t help it. I just see a problem, and I have to fix it. I actually don’t know whether my jury thing will go to trial, or even whether I’ll be approved of as an acceptable juror. Hope is not lost. I’ve got ideas. What if I hear voices?